No Gym No Problem Virtual Personal Training | Eat, Train, Thrive! For the woman who wants to get STRONG and Fit Right at Home! If you keep saying things like, “I really need to get a fitness routine going, look at me!” or “Ugh, I’m so mad I missed my workout again!” You’ll want to read on to what could be the beginning of your new normal. Hint: you’re Tight, STRONG, Fit and feeling fine! You're busy, and even though you keep wishing you had a workout routine, for some reason, no matter what you do, nothing sticks. How to train, what to do can be complicated. How are you supposed to know when to change the program, add progressive overload, take days off, and how much cardio is the right amount? Trust me, women are doing way too much. The even better news, you don’t have to worry about thinking, planning, or deciding when to do what, well, I've got you. And the best part, we can train you anywhere, with a good WIFI connection and me as your coach - you'll be set to Lift The Things. With my No gym, No problem programming, you can achieve your fitness and health goals right at home. What is the No Gym, No Problem Program? It is a LIVE personal training session via video conference like Skype, where you and I meet at your scheduled time for your customized 1:1 session right in the comfort in your home or for my travelers - hotel. After an initial evaluation, I will come up with your customized training program so you can smash your goals and maybe even discover things about yourself you didn't even know was in there... getting strong can do that to us! Accountability and Support from a Coach who knows how to train and get results right at home — after all I live in an RV (a home on wheels) and don’t always have access to a gym, so I’ve become something of an expert! Consistency with your workouts (right at home) because when you know what to do, how to do it, and when to do it – it’s so much easier and exciting to take action. Education on how simple it is to get a great workout anywhere with just dumbbells if that’s all you have available! Snap-to-it efficient workouts that will make you better and leave you feeling accomplished and proud for getting it in! Book a No GYM No PROBLEM Discovery Call HereOn this call we talk about your goals and see if we are a great fit to work with, after all, we will be spending quality time together between planning your customized plan and Lifting All The Things in our weekly training sessions together! I'm an Online Fitness and Nutrition Coach. I help women quit the diet obsession and get STRONG from the inside out. My passion lies in helping women achieve their goals in a sane, simple, and sustainable manner. I created the no Gym, No Problem Program because I want women to see how simple it is to get your workout in anywhere. No more hitting pause or saying eff it if you can’t make it to a gym! The convenience of training right at home, or while you're traveling can be a game changer for people with fitness goals - that’s you, right? You don’t have to sacrifice your workouts just because you can’t get to the gym. My STRONG friend, you just have to adjust and adapt your training to make it work no matter where you are! Now you might be thinking how. And I get it, you may not be used to all this online talk of video conferencing and customized workouts. I also know, hiring a coach is an important decision and one that requires your due diligence. So, let’s get on a no BS call and make sure this is the right program for you. “Virtual training with Candace has been an amazing experience! I love the flexibility of being able to get an effective workout from home! I no longer have an excuse for not being able to get my lift on. 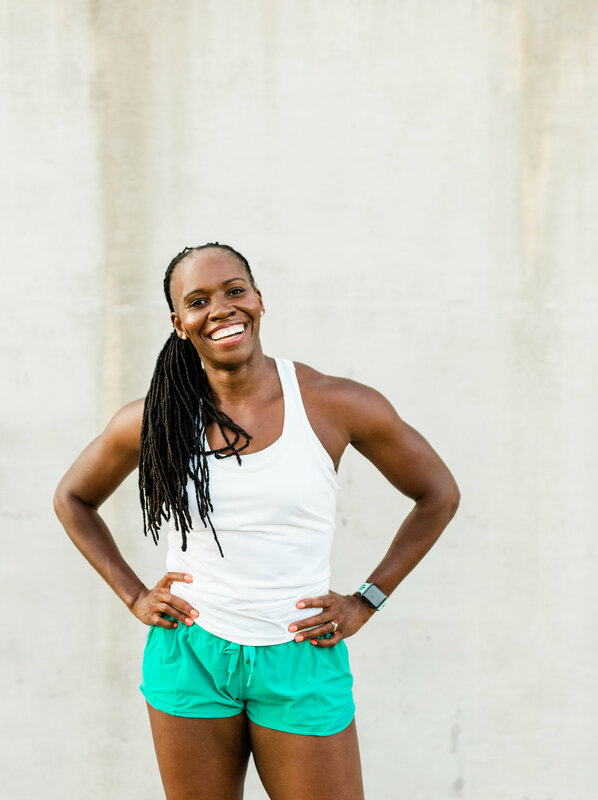 Candace's approach to a healthy, sustainable lifestyle has been a breath of fresh air! She does not believe in diets, cleanses, quick fixes or extremes. Slow and steady wins the race! In the short 4 weeks, I have been working with her. I have lost many inches and become much stronger! Who is NO Gym NO PROBLEM for? Women who may be struggling with sticking to a training regimen and want the support of a seasoned coach. Women who like to lift weights – this program is not for beginners! Women who have trained with weights before and understand the basics of Strength Training. Women who want to make the best use of their time. Women who want to get strong and fit! Women who don’t like to lift the things! This is program is not for beginners or for someone who has never lifted weights! Women who are looking for quick fixes. Women who are too busy to prioritize their health. Women who use exercise as punishment. Women who feel that it is either ALL or NOTHING. If you're ready to get your Lift on Right at home or wherever, book your Discovery Call by Clicking on the Button below. You in STRONG Friend?! If you are, click that button below to Book your No GYM No PROBLEM Discovery Call to see if the No Gym No Problem is the Training Program for you!